Did you know that your skin is the largest organ in your body? It protects us from infections, dehydration and the hostilities of the environment. There’s no wonder it deserves a whole lot of TLC! Aside from all the moisturisers, serums and BB creams that we can apply from the outside, one of the simplest things you can do for radiant-looking skin is to take care of it from the inside first. 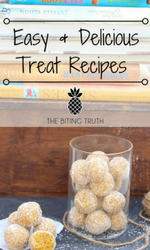 Abs aren’t the only things made in the kitchen; clear, beautiful skin can be, too! That’s why we’ve put together our top 8 favourite foods for a glowing complexion. Orange veggies like carrots (pumpkin and sweet potato, too!) contain ‘beta-carotene’, which protects your skin from harmful UV rays and prevents the development of wrinkles and visible signs of ageing. Beta-carotene is converted into vitamin A in our bodies and helps to regenerate and maintain smooth and supple skin. Remember to keep the skin on as most of the nutrients lie skin-deep (and for the extra fibre boost)! You can buy carrots by the kilo and prepare them in many different ways. We love them roasted, added to stirfries or simply cut into sticks and dipped in hummus! 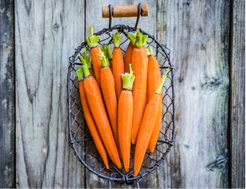 Dry scaly skin is a symptom of vitamin A deficiency, so try adding some extra orange veggies to your shopping list if you notice these signs! 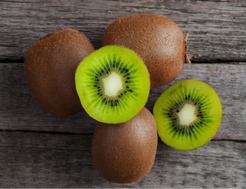 Did you know that kiwi fruits have more vitamin C than an orange per 100g? Vitamin C is important for making collagen, which provides the structure and elasticity of skin and keeps it firm and wrinkle-free! 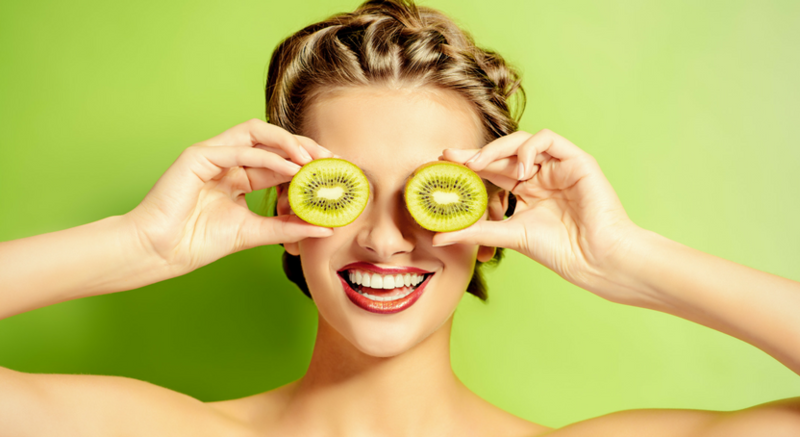 There’s another reason to tuck into kiwis – it boosts wound healing, so can help to quickly clear up breakouts and scarring! 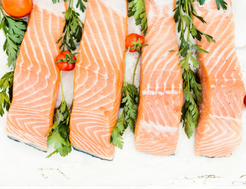 Salmon, mackerel, sardines… not only are they Y.U.M., but are also packed full of healthy fats – namely omega-3 fatty acids. These fats are anti-inflammatory, helping to prevent breakouts and flare-ups of skin conditions like eczema and psoriasis. Omega-3 fats also help to keep the skin moisturized, leaving your skin looking and feeling fresh and hydrated. Another benefit of mackerel in particular is its richness of vitamin B12. A deficiency in vitamin B12 can cause uneven skin tone and flakiness. Try one of our favourite fish recipes here. These bashful delights are rich in lycopene, a phytochemical (an antioxidant that comes from plants) that helps to prevent damage to our cells caused by UV rays. 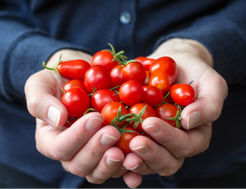 To boost the lycopene content of your tomatoes even more, try cooking them instead of eating them raw. But remember, sunscreen is always number one for sun protection! 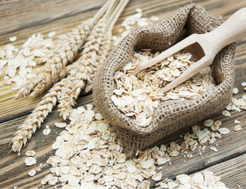 In comparison to their refined counterparts, wholegrains (like oats, barley and brown rice) lead to a smaller spike in insulin, the hormone for energy storage. A spike in insulin raises the levels of other hormones responsible for releasing oils that get trapped inside our pores, eventually leading to a breakout. Along with sunflower seeds and almonds, your brunch time avo is packed with vitamin E which has antioxidant properties. You can find vitamin E claims on moisturisers and masks, since it reduces inflammation from breakouts and clears out free radicals that damage our cells. 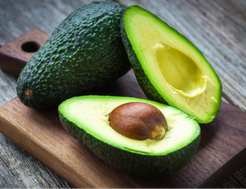 Rather than hoping it rubs into your skin, why not have an avo for nourishment from the inside out! Having avo as art of your meal also boosts the satisfaction of the meal by 25%, so you’ll also be less likely to reach for sugary or fatty foods that counteract your healthy skin habits. These are a fantastic source of protein, which helps to maintain the integrity of your skin, repair damaged skin cells and make collagen. They’re also rich in biotin, which prevents dry skin, as well as other micronutrients that play a role collagen production, preventing wrinkles and fine lines. 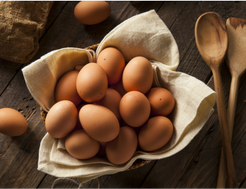 Read more about why we love eggs here and get cracking! 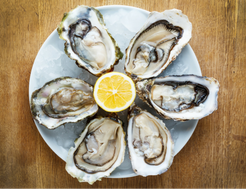 This seafood is one of the best natural sources of zinc, an important nutrient for normal growth and functioning and repair of body cells – including your skin cells! Zinc also plays a role in the sebaceous glands which produce natural oils, which makes them a must for clearing up a breakout. We hope that these tips will help you on your way to beautiful skin! We’d love to hear about any other tips or tricks you have to keep your skin clear and radiant all year long. 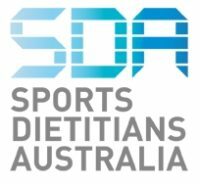 This article was written by Melissa Meier and Michelle Hsu, who are interns at The Biting Truth and are currently studying their Masters in Nutrition and Dietetics at The University of Sydney.